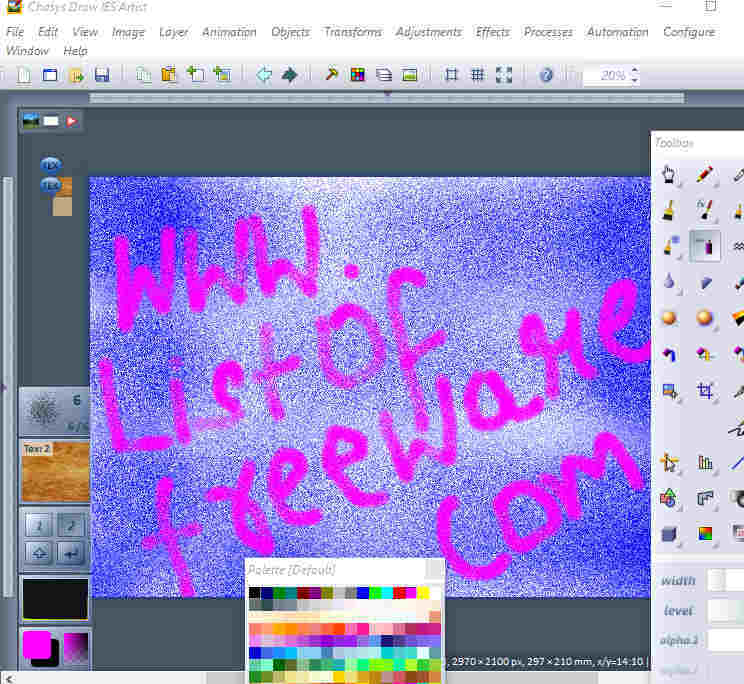 Here is a list of best free drawing software for Windows. 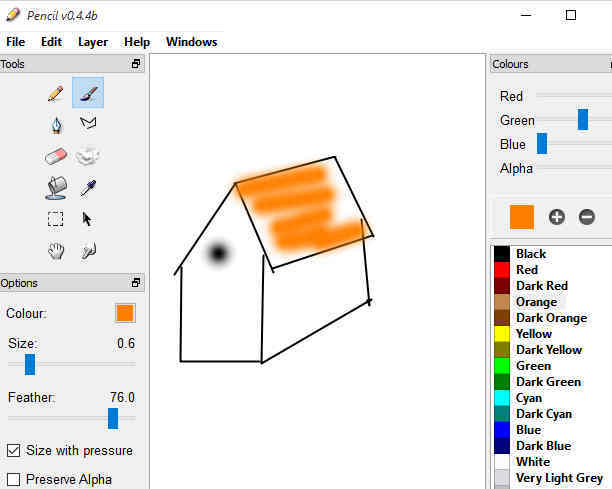 Windows provides its default Paint software for free, which lets you do some basic drawing; however, if you are looking for drawing software with advanced drawing options, this list will come in handy. With the drawing software mentioned here, you can draw and sketch using different types and sizes of paint brushes, pencils, and pens. You can digitally put your creativity to life with these drawing software. Use your mouse to draw or simply draw with the help of your fingers on a touchscreen device. Some of these software let you open multiple canvas to work on multiple drawings at a time. One of these software also lets you draw with your friends on the same screen, over the internet. Some drawing software are designed for kids and include pre-loaded drawings, where you just have to fill colors. Almost each of these digital drawing software provide distinct features and tools. Go through the list to know more about these free sketching software and decide what suits you the most, based on their features and tools. My favorite drawing software is SmoothDraw, as it lets you draw and sketch with a large set of drawing tools. The tools include a variety of paint brushes, pens, and pencils. You can pick different shades of colors and even add several effects to your drawing. Smudge tool is also available, which lets you mix colors on canvas easily. You will find almost all basic editing tools in this free painting software, like: cut, copy, paste, save, print, clear, undo, redo, rotate, flip, zoom, etc. You can also check out the list of Best Free Scrapbook Maker Software For Windows, Best Free Audio Book Reader Software For Windows, and Best Free Desktop Publishing Software For Windows. SmoothDraw is a free drawing software. You can start drawing on a canvas of customized dimensions. It can fill canvas with foreground and background colors. Here you will find a variety of pen, pencil, and paint brush tools to draw objects and fill color. Brush strokes can be controlled by changing brush pressure and hardness. Some stickers and stamps are also available, which you can use in your drawing. You can use 2B pencil, leaky pen, felt pen, bristle brush, dry media, digital airbrush, fine spray brush, and many more drawing tools. Color palettes let you use different shades of colors. You can also use Clone brush to pick similar texture of an object to use. To give more creative touch to your sketch, Smudge tool can be used. Various other effects, like: blur, dodge, etc. can be made use of. Another highlight of this drawing software is support for Layers. This drawing program lets you zoom according to percentage and rotate your drawing. Save your drawing in png, bmp, jpg, gif, tga, or tif. It can run of the following Windows versions: Windows 10, Windows8, Windows7, Windows XP, and Windows Vista. 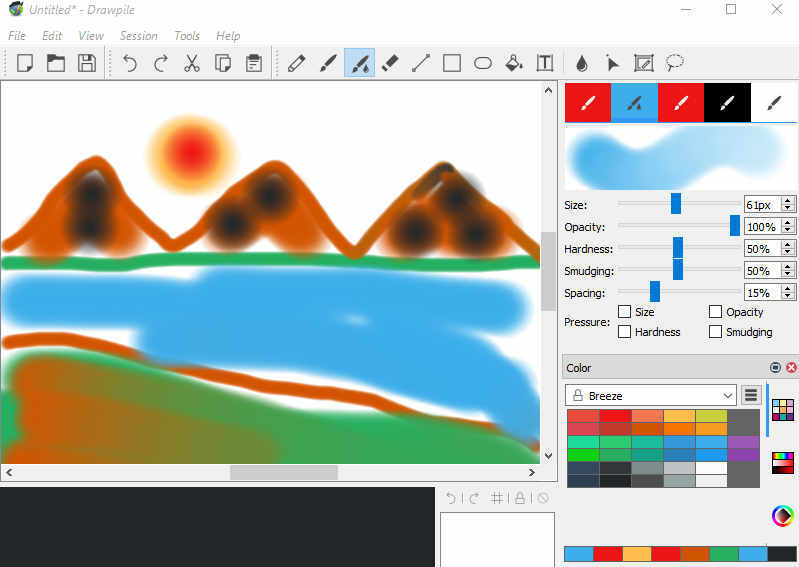 Krita is an open source painting software for beginners as well as professional artists. The tools available are so extensive that you can draw simple as well as concept art, texture art, illustrations, and comics here. It lets you draw on a canvas of custom size. It lets you paint with paint brushes of various shapes, strokes, and sizes. Make use of Layers and Layer Masks to draw and give effects separate effects, non-destructively. It features multi-brush to draw mirror strokes. Shortcuts can be set up for the tools you commonly use. Brush Stabilizer is an amazing feature for making flawless drawings even if you have shaky hand. Brush Engine lets you customize brushes according to your need and lets you save them, so that you can use them later. Krita lets you add shapes and brushes to your collection by browsing and downloading other artists’ collections. You can also share your brush set with the world. An advanced color management tool is available, which lets you visualize and use colors of your choice. Availability of transformation tools, HDR support, advanced color pallet, selection tool, and Open GL support, makes this software a complete package for creating stunning drawings, paintings, and art work. Krita has its own training resources to help you learn drawing with it. This advanced drawing software claims to open PSD files that even Photoshop cannot open. You can also save your work in PSD format and other image formats, like: XBM, XPM, TIFF, TGA, PPM, PNG, JPG, GIMP, GIF, EXR, CSV, etc. Its a multi-platform drawing software available for Windows, Mac, and Linux. 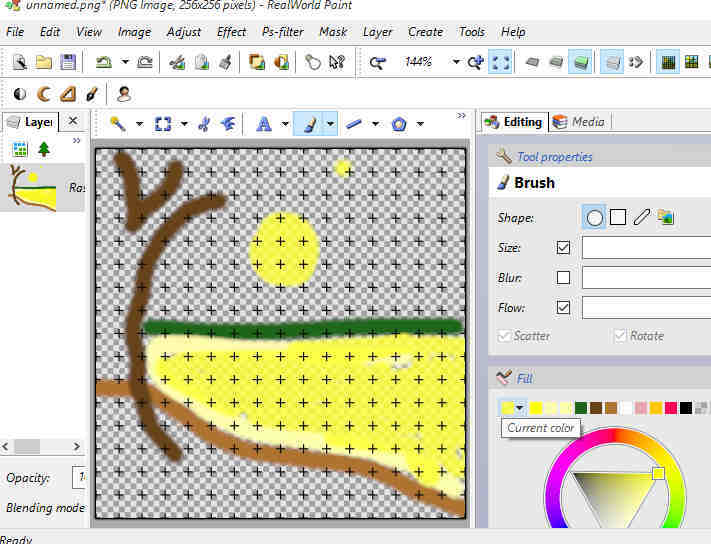 RealWorld Paint is another free software for drawing on PC. 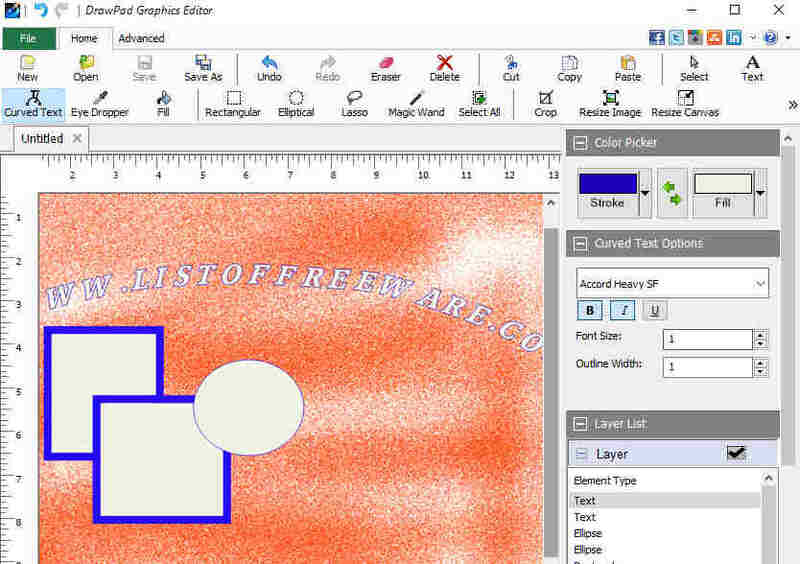 This drawing tool lets you create both raster and vector images. You can not only draw, but retouch images, and make animated GIFs with this software. Basic image editing tools to edit, crop, resize, and cut out an object from a photo are available. A set of brushes, pen, and pencil tools are available, whose size, opacity, pressure, and hardness can be changed to create amazing drawings. Make use of Layers to apply effects and styles on separate objects. Apply effects to text or other objects by using bevel, shadow, fill, outline, and glow options. Vector illustrations can be made easily with the help of shape tools and color tools. Support for PSD and SVG formats makes this drawing software a powerful one. Clone Tool and Liquify tools are available, which make this software a good alternative to Photoshop. GIMP is another open source image manipulation software which can be used as a drawing tool. You can use it for leisure as well as professional digital drawing. It has an extensive suite of painting tools which includes brushes, pencil, airbrush, cloning, etc. with customizable pressure, hardness, and opacity. Work with Layers to give your painting a detailed touch. You can visit GIMP Plugin Registry to download a number of tools to help you make drawings and edit images. Numerous brush and filters presets are available as plugins. It also lets you rotate, scale, shear, and flip a drawing. You can zoom, add effects, add text, add objects, etc to an image. Image retouching options are also available. GIMP is another good alternative to Photoshop. It supports a wide range of image file formats, like: JPG, GIF, BMP, PCX, PDF, PS, MPEG, TGA, TIFF, XPM, PNG, etc. It works on multiple platforms: Windows, Linux, and OS X.
Inkscape is a free vector graphic software, and can be used to create drawing on computer. It has a large set of drawing tools, which make it an awesome drawing freeware. You can use paint brush, pencil, eraser, and various geometrical shapes to make drawing, and you can change the opacity and size of these tools to get desired result. You can also use clipart in your drawings. Clone tool is another important tool available. Although its a vector graphic software, it supports creations of embedded bitmap images. Apply filters to apply special effects to your drawing. Add text in various colors, font style, font size, etc. You can rotate and flip text, objects, and images in angles. Images can be exported as PNG. You can import SVG, EMF, PDF, WMF, CCX, CDT, etc. files. Its a muti platform software and works on Windows, Mac OS X, and Linux. MyPaint is a free digital painting software. You can draw and sketch using a bunch of brushes. It lets you add effects just like handmade paintings. Drawing tools like: Watercolor, 4H Pencil sketch, 2B pencil, rigger, sponge, ball pen, g pen, blending, spray, airbrush, and various other options are available to help you make a perfect piece of art. You can change size, transparency, and hardness of brush, pen, pencil, and eraser. 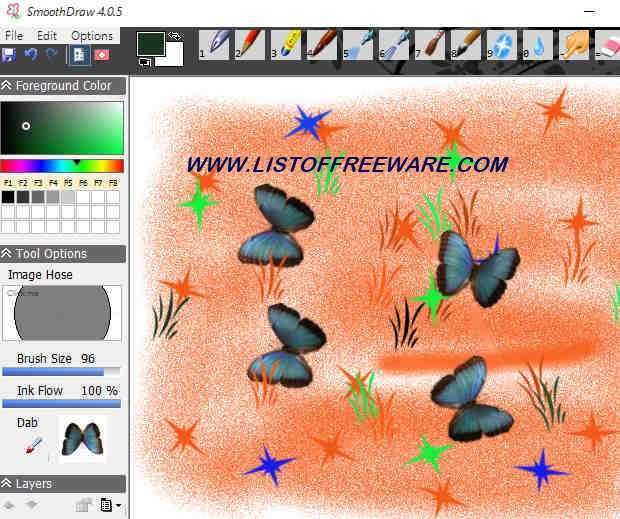 Undo and Redo options are also available in this free drawing software. Layers help you a lot in giving your drawing a professional touch. Layer properties can be changed as well. Different shades of color can be selected through color sampler or color triangle. Save your drawing as JPG, PNG, ORA, etc. 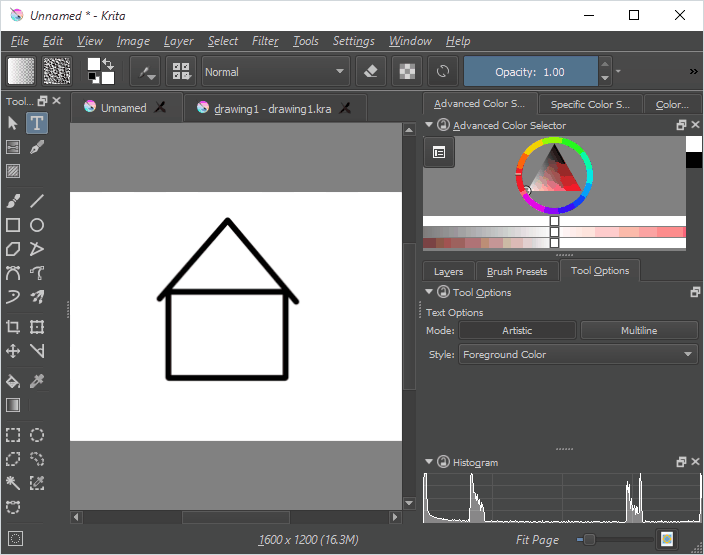 PictBear is another free paint program for Windows. Its has multiple tabs support, which helps you to work on multiple projects at a time. It features brush, pen, pencil, eraser, and geometrical shape tools, which can be used in different sizes. This drawing tool also has Layer support. You can add your own text in various fonts, sizes, colors, and styles. It also has tools to add various effects to drawings. Make use of Smudge tool to give your drawing a detailed look. Save your drawing as pbx, pcx. tiff, tga, gif, jpg, psd, png, etc. Export option is available for jpg format only. Pencil2D is a simple free drawing software. Here you will find a limited number of drawing tools. Tools like pencil, pen, color picker, eraser, polyline, etc. are available. Size of these tools are adjustable. The Polyline tool lets you draw geometrical shapes, like: triangle, rectangle, circle, etc. You can move and zoom canvas to draw easily. You can select, move, and flip objects as well. Color appearance can be changed by changing RGB combination and applying alpha effects. Different types of Layers can be added, like: bitmap layer, camera layer, sound layer, and vector layer. DrawPad Graphic Editor is a free paint and sketching software. It supports multiple tabs so that you can draw multiple projects at a time. Use pencil, spray paint, various shapes, clipart, crayons, and many other tools to make digital drawing. Customize brush size manually according to your requirement. You can even add text in various size, fonts, styles, colors, etc. It lets you fill colors to background and change its transparency as well. Apart from these, other basic image editing tools are also available, such as: cut, copy, paste, move, resize, etc. You can easily use it to create business cards, banners, letterheads, logos, newsletters, menus, and signs. Images of different formats can be added to your drawing, like: jpg, png, pcx, psd, bmp, wbmp, ico, tiff, tga, etc. You can also insert clipart from the clipart library. Save your drawing as .drp, .jpg, .png, .bmp, .ico, .svg, .pdf, and .eps. It has option to let you share drawing via email. Drawpile is a free collaborative drawing program. It lets you draw with multiple users simultaneously on the same canvas. It features almost all basic drawing tools and lets you draw with different brushes, pencils, and colors. Brush parameters can be changed, like: size, shape, and saturation. It supports Layers and lets you change layer blending mode and transparency. Onion skin layer view mode is a really interesting feature, that lets you view drawing progress in fast forward. Create and export GIF animation of the recorded session. To begin collaborative drawing, you need to host a session first. Hosting a session and joining a session is pretty easy. Check the “Hosting Sessions” page to know more about it. Supported platforms: Windows, Linux, and OS X.
Alchemy is a very basic drawing and sketching software with limited drawing tools. Although the brush tool is very basic, it can be used to draw simple art. The software cannot create detailed art work, but is supposed to be used as a place where you can begin with the initial stages of an art work. It has a set of brushes and tools to create various shapes, such as: Speed shape, type shape, x shape, trace shape, inverse shape, and median shape. Transparency of shapes, color of shapes, foreground color, etc. can be changed to create amazing effects. Paint.NET is a famous image editing and drawing software. Its support for Layers makes it a desirable tool for digital drawing and image manipulation. Drawing tools, such as pencil, pen, paintbrush, etc. can be used in different sizes. various shapes can also be inserted in drawings, like: square, rectangle, circle, stars, arrow, etc. Customized text can also be added in Paint.NET. Use Effects to enhance your drawing, such as: blur, sharpness, distortion, etc. Various transformation tools, selection tools, and editing tools, make this software a must have. A large number of raster and vector image formats are supported by this painting software. This includes jpeg, png, tiff, svg, eps, psd, gif, etc. Drawing 4 Kids is a simple freeware to draw and sketch and is designed for kids. It helps kids to learn how to handle the mouse. Its lot of fun for kids to use this freeware, as it has various coloring, paint brush, brush model, brush stamp, and drawing options. Brush size can be changed pretty easily. It contains a variety of stamps to be used in drawings. It also contains some inbuilt drawings to fill color. Kids can use these drawings to fill color. This drawing software runs on the following Windows versions: Windows 10, Windows 8, Windows 7, Windows XP, Windows 98, Windows 2000, and Windows ME. Chasys Draw IES is a free image manipulation software, which can be used to draw digital paintings. Apart from image editing, it lets you draw on canvas of custom dimensions. Use paint brush, pen, and pencil tools to draw with various types of stroke to give different effects. Stroke size can be changed for detailed painting. Geometrical shapes like line, square, rectangle, circle, etc, can be inserted to your drawing easily. Smudge tool helps you to mix colors on the canvas. Layer support is available and you can add, lock, or unlock layers. Different effects can be added, such as: blur, sharpen, color, alpha, noise, distort, etc. You can also adjust hue, saturation, brightness, contrast,etc. to manipulate images. Save a drawing in different formats, such as: jpg, png, ico, gif, tiff, etc. It also supports camera RAW formats. Sketch Studio is another free digital drawing software. You can draw here using basic drawing tools, such as: pencils and sketch. Smudge tool will give a retouch to your drawing. You can save your sketch as .sketch, .bmp, and .jpg. You can save a drawing as screensaver directly from here. 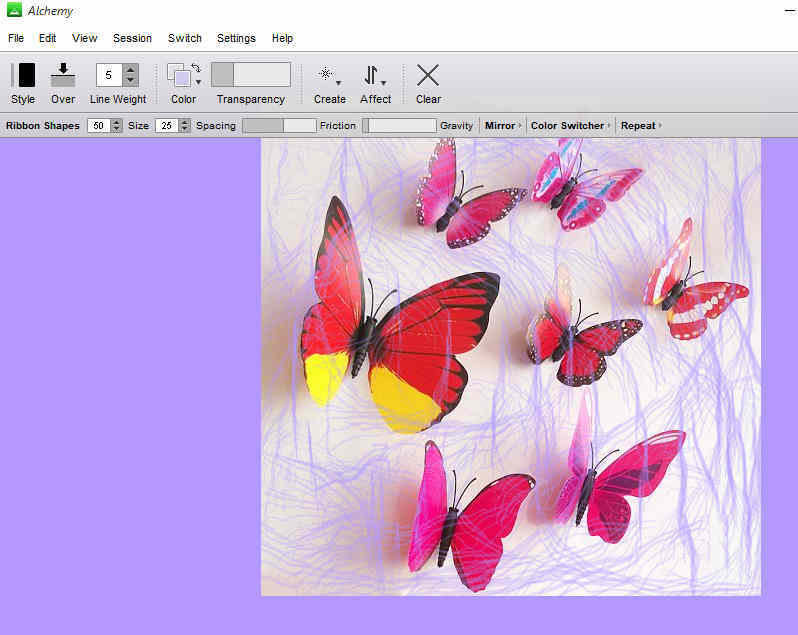 This drawing program is basically designed to help children learn to draw on a computer. Easel is a free digital art software. It lets you draw using different colors, geometrical shapes, and brush on a canvas. Any shades of color can be used as background color for a canvas. You can use different sizes and shapes of brush to draw on canvas. You can also add text in various font, size, color, etc. Here a coloring book is available which contains three inbuilt sketches. You just have to fill color in them. Its another software dedicated to kids. You can print a drawing or save it as png, jpg, gif, tiff, bmp, etc. 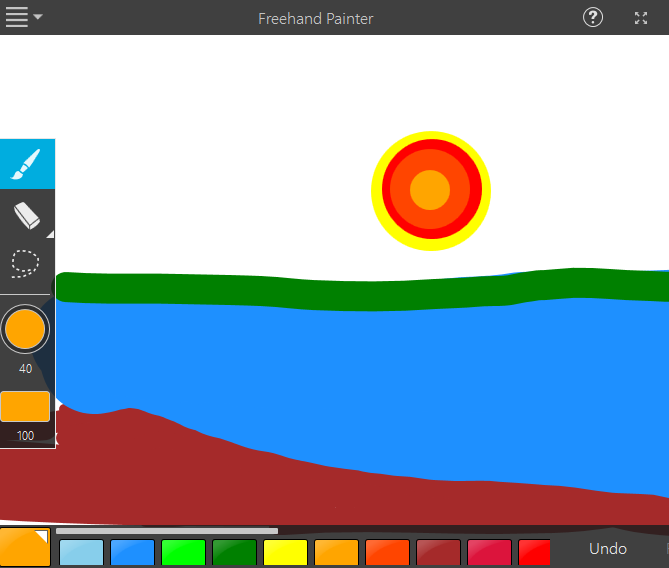 Freehand painter is a free digital drawing software. It provides you a canvas to draw and paint. You can use paint brush, eraser, and colors to draw something. Brush size can be adjusted to make drawings precisely. Lasso selection tool lets you freely select a portion of drawing to edit. You can undo and redo a single action or clear the canvas. It has been primarily designed for touch screen PCs to let you draw with your fingers. Export your drawing as BMP, PNG, GIF, and JPG file, and Save as ISF format.